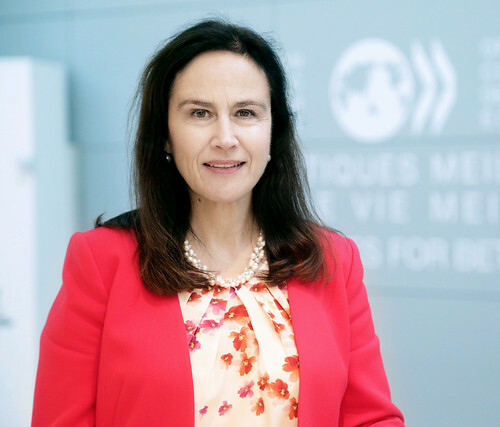 Ambassador Anna Brandt took up her duties as Ambassador and Permanent Representative of Sweden to the OECD in Paris on 17 September 2018. Ms. Brandt holds a Major in Economics and International Business from the Stockholm School of Economics and Business Administration. From 1990 to 1998, Ms. Brandt served in the Swedish Ministry for Foreign Affairs, as First Secretary, Chief economist and finally as Director and Head of Department for East and Central Europe (1995 – 1998). From 1998 to 2001, Ms. Brandt worked at the World Bank, in Washington DC, USA. She was Alternate Executive Director and Member of the resident Board, representing Denmark, Estonia, Finland, Iceland, Latvia, Lithuania, Norway and Sweden. Ms. Brandt subsequently returned to the Swedish Ministry for Foreign Affairs, where she served as Director and Deputy Head of the Asia Department (2001 – 2002) and Deputy Director General and Head of the Africa Department (2002 – 2006). From 2006 to 2009, Ms. Brandt served as Ambassador and Head of Mission in Nairobi, Kenya and returned to the World Bank as Executive Director and Member of the resident Board (2009 – 2013) again representing the Nordic and Baltic countries. In 2013-2014 she was Ambassador at large for Agenda 2030 and the SDGs. From 2014 to 2016, Ms. Brandt represented Sweden, Estonia and Iceland in the European Bank for Reconstruction and Development (EBRD) in London, as Executive Director and Member of the resident Board. Prior to taking up her duties as Ambassador and Permanent Representative of Sweden to the OECD, she served as Ambassador to Dublin, Ireland (2016-2018). Ms. Anna Brandt is married to Mr. Stefan Falk and they have two sons.